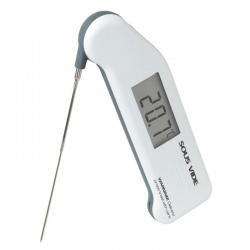 The factory setting for your Thermapen display is for °C. To display °F, move the switch numbered '1' to the "on" position—towards the batteries. 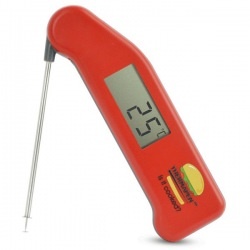 The factory setting for your Thermapen display is to show temperatures at tenths of a degree (0.1°) for both °F and °C. To change to whole numbers (1°), move the switch numbered '2' away from the batteries. The factory setting for your Thermapen is with the auto-off feature enabled. This means your Thermapen will turn itself off ten minutes after you extend the probe and turn it on, to preserve battery life. Once off, you will have to close the probe and extend it again to turn the Thermapen back on. To disable this auto-off feature while taking lengthy readings, move the switch numbered "3" to the 'on' position—away from the batteries. 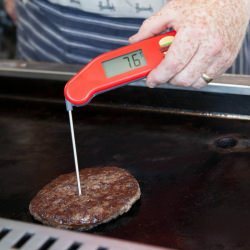 This feature allows you to set an offset that will automatically add or subtract a number of degrees from your Thermapen readings. It should NOT be needed for normal use. * Remember, with auto-off disabled, your Thermapen will stay on and continue using battery power if you forget to close the probe.